Lesa McIntosh, member of East Bay Municipal Utility District (EBMUD) Board of Directors, will provide a timely presentation about the current water supply and the drought. Lesa has served on the EBMUD Board of Directors representing Ward 1 since 1999. This includes the Contra Costa County cities of Crockett, Hercules, Rodeo, San Pablo; portions of Richmond and Pinole, and the communities of North Richmond and Selby. Lesa is responsible for policy decisions affecting more than 1,800 employees, 4 labor unions, 1.3 million water customers and some 600,000 wastewater customers. She is the first African American woman Vice President (2005) and President (2006 – 2008). Lesa grew up in Richmond and attended Richmond Public Schools, graduating a year early from Kennedy High School. She has her B.S. in Political Science from UC Berkeley and her J.D. from John F. Kennedy School of Law. Lesa has practiced law in the city of Richmond for 24 years, with a current focus on business, estate planning and probate. Lesa is also dedicated to the community and serves on the Contra Costa County Bar Association, NAACP-Richmond Chapter, the Board of the League of Women Voters and as an instructor for Contra Costa College, among others. President, Stoney Stonework welcomed everyone to the meeting and led the Pledge of Allegiance. Stoney asked everyone to take a moment of silence for freedom, peace, and justice on earth. Sid’s thought for the day was, the definition of a ‘politician’ is one who shakes your hand before the election and your confidence after. Bill Koziol gave the Sunshine report stating he’d seen Charlie Wong and that he is in good spirits and appreciates phone calls. Ralph Hill had surgery recently and will be undergoing radiation therapy for three weeks. He is in the Greenridge care facility in El Sobrante. Mark Howe reminded everyone to donate books for the West County Reads book drive. David Brown announced that we now have $1,500 for the Peres Elementary School teacher fund. The goal is to give each teacher in the school $100 toward classroom materials and supplies. If you’d like to donate, please bring a check to David. Stacey Street introduced today’s speaker, Dan Ashley, news anchor for ABC7 news. 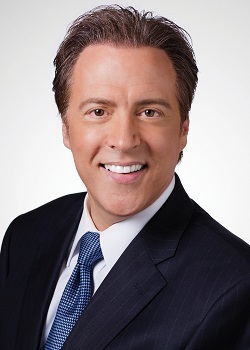 Dan has been an anchor for over 30 years, 20 of them with ABC7 here in the bay area. He’s covered major news stories locally, nationally, and internationally. He serves on numerous boards including the Red Cross, the Contra Costa Crisis Center, CASA, and others. He also sings with a rock band called Push which does classic rock covers. Dan started off saying that bringing back stories to tell the public is a sacred trust and one he takes very seriously. He also noted that having a job that allows him to go and speak to others is very rewarding. He talked about broadcasting in terms of the impact of technology on news. In past years the news was on at six and 11:00 but now it’s required to be on at 5, 6, 10, and 11 daily. CNN started this trend with a 24-hour news cycle and it changed everything. The expectation is now that news will be reported immediately and as it happens. As a result, local news is often about updating and keeping the story refreshed as it unfolds. This whole trend has damaged newspapers dramatically. In past years, newspapers would be all over the newsroom – advanced copies of newspapers from everywhere would be used to source broadcast news stories. This is no longer the case. Now, there isn’t a single newspaper in the newsroom where he works. When a big story hits they go into what’s called a “continuous coverage” mode. If they don’t, the public will find the story somewhere else so they have to be on at the same time as CNN, MSNBC, Fox, etc. If a story is big enough to “cut in” on regular programming they know that no matter how big the story is, they will get calls from those who are angry because they cut in on Jeopardy. Social media is another facet of electronic communications impacting news. Dan is now required to Tweet on a regular basis. At its core, though, the job of news reporting is the same as it’s always been. Dan noted that the most important thing is to live in a place where the news can be freely reported and where ideas and beliefs can be expressed openly.